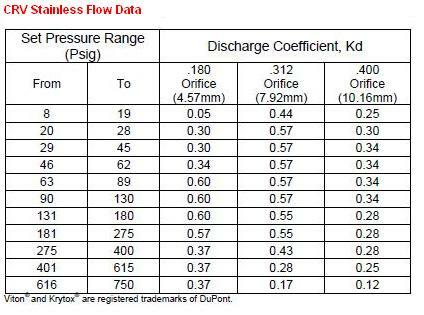 Generant’s Flow Calculator is a useful tool for determining relief valve flow capacity. In order to protect against an overpressure condition, pressure relief valves must be sized as a function of discharge flow capacity. The valve’s required discharge capacity must be determined through an analysis of the total system design. Generant’s application engineers can assist in this process. The user inputs the valve orifice diameter, discharge coefficient (Kd), upstream and downstream pressures, flow temperature, and the working gas. 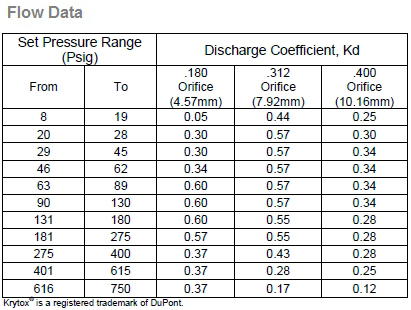 Values for orifice diameter and discharge coefficient can be found in the reference tables below. 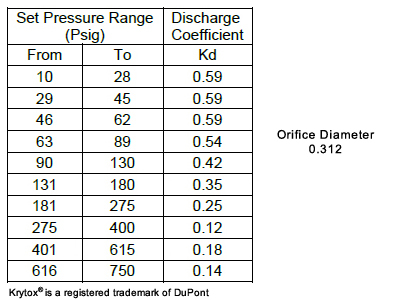 The user should select an orifice size based on the intended valve size and a Kd value based on the intended set pressure. The upstream pressure should be specified as 110% of the relief valve’s nominal set pressure. The downstream pressure (0 PSIG if valve vents to atmosphere), upstream temperature, and working gas should be chosen to reflect the user’s application. Generant’s flow calculator utilizes the formulas and method described in European Standard EN ISO 4126-1. Click here for a detailed explanation of our Flow Calculator. Note: PDF files require Adobe Reader to open/view. Are you calculating CO2 Flow? Assumptions: Fluid behaves as an ideal gas. Note: Generant recommends using a 90% safety factor when sizing from the flow calculator output.